Today some management «gurus» dismiss the seminal work of Drucker, just because its foundation lies in his work starting in the 1950s and because things changed dramatically since then. They are wrong on both arguments. Its foundation lies hundreds of years earlier: in the practices of the British civil administration in India (18th century), as well as in the works of J. B. Say (1767 – 1832), Comte de Saint-Simon (1760 – 1825), Alexander Hamilton (1757 – 1804) or even earlier John Calvin (1509 – 1564) and Ignatius of Loyola (1491 – 1556). Secondly, his concepts are not out- dated by the developments of the last 60 years. Only with the dramatic developments in our society, economy and technology we are slowly able to effectively incorporate his insights into our work – to make knowledge work productive and knowledge workers achieving. 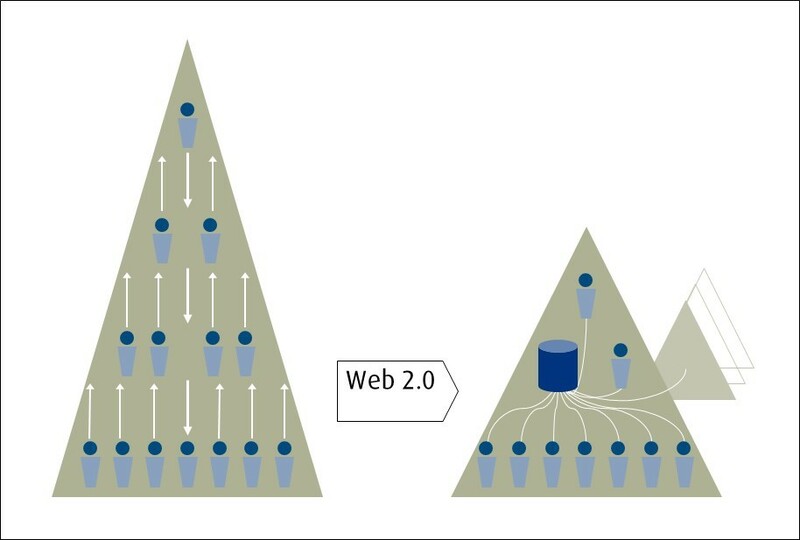 The benefit of web 2.0 in the context of this article is not only to give a nice analogy illustrating the ultimate breakthrough of Peter F. Drucker’s work. Only the penetration of modern information and communication technology make his concepts of management applicable to their fullest extent. Thus to study the concepts of what is now known as web 2.0 helps to understand how Drucker’s concepts are propagated by modern technology. Already the very first web browser who gave birth to the internet was a browser and editor. It was designed for everybody to publish and share information. However the first utilisation of the web was to simply transfer marketing catalogues and content from print to online. It was just a more efficient way to distribute existing, centrally produced information. Later, the emergence of web-shops allowed users to shop more efficiently. Still, this was just a transfer of existing brick and mortar stores to the internet. Only with the growing popularity of the internet, through better accessibility and easier-to-use technologies, the original concept of the internet was breaking through. Ordinary people are now able to publish news (twitter) and videos (youtube), to share knowledge (wikipedia), to sell products (ebay) and to network globally (facebook). The big difference to earlier days is that there are no central powers that publish news and videos, compile knowledge, sell products or grant access to networks. There are only central platforms organising decentralised interaction. Legendary examples are the bottom-up presidential election campaign of Barack Obama in 2008 or the resignation of the Japanese finance minister Shoichi Nakagawa after being broadcasted on youtube appearing drunken at a G7 press conference. Being at the beginning of this journey, we try to apply successful concepts of the past to the challenges of the future. We use «scientific management» methods to manage knowledge work and knowledge workers. We try to make the management of knowledge workers more efficient. We aim to reduce the time needed to write job descriptions, to set objectives and to define performance indicators. Thus we use efficient tools to «copy/paste» pre-defined best practice contents. As if the criteria of productivity would be how many job descriptions a manager is able to produce per hour. What becomes obvious in these examples is that solely increasing efficiency is not the right thing to do. It is comparable to simply transferring print brochures to online websites without exploiting the full potential of the web. As Drucker pointed out often times, the productivity of knowledge work largely depends on doing the right things. And there is no shortcut for thinking through one’s own contribution. And at this stage the real application of Drucker’s insights starts. A telling example is to ask a consultant, what his task is about. He tells you «I consult. I assist customers in finding solutions, evaluating alternatives, and getting them implemented.» Ask another consultant, and she tells you «I lead customers. I ask them, what they want to get accomplished and I lead them through the process. I do the work you similarly would expect from a mountain guide.» Both understandings of the own job are neither right nor wrong. But it is obvious that these two consultants will do another job, measure their success on other criteria and have another contribution. They have to decide, what is required to get their job done. But both will – with high probability – be more productive than a consultant who has not thought through his tasks at all. At the beginning of the last century only a few could imagine, that an efficient shoemaker doing twenty shoes per month would be doing a thousand shoes per month at the end of the same century. This and other productivity gains became possible with the right methods and tools. Until the end of this century a travel agent will not only service twenty clients per day but a thousand, a physician will not only cure twenty patients per day but a thousand, a manager will not only have twenty direct reports but a thousand. Yet these images create some understandable discomfort. These achievements will not be reached by doing the things we actually do more efficiently or faster or more automated but by focusing on doing the right things. The open source software community is a modern example, how this can work and that it really works. Hundreds and thousands of otherwise unconnected people are working together on one of the most complex pieces of software: operating systems. They all know their contribution, they all understand how to measure the quality of their work and their work is reviewed by peers. They manage themselves, define their own jobs, set their own goals, and reward themselves through the results of their work and social status they gain in their community. There are only a few managers in this quite big organisation. One of the oldest and most successful management concepts can be found in the way of how to organise and rule a society. It is democracy. Everybody is entitled to define his program, for which he wants to be elected. Everybody is entitled to elect a person or program, he thinks fits best to his needs. And every majority is entitled to bring down a government. In the long run democracy outpaced dictatorship, communism and monarchy by all criteria of productivity, e.g. economic wealth creation, technical innovation, cultural achievements, or social development. Big corporations and organisations started to evolve mainly during the industrialisation. They were organised to minimise transactional costs. Structures and procedures were designed to reduce the costs of getting resources, of co-ordinating work processes, of working out contracts, of enforcing commitments, and of leveraging investments. With the evolvement of web technologies transactional costs decreased dramatically. Now it is easier for everybody to get relevant information – one of the main resources in the knowledge work. 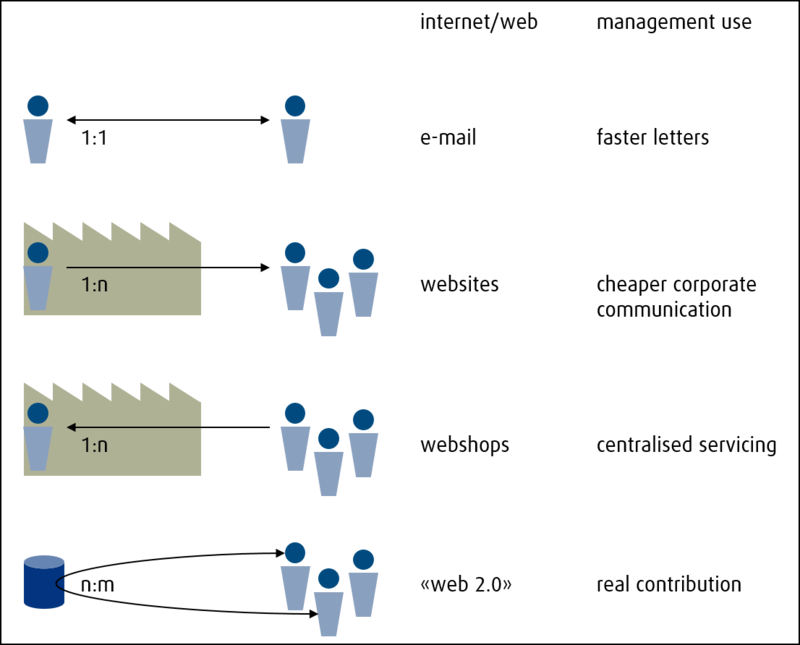 Platforms support the co-ordination of different work processes. They institutionalise levels of trust based on feedback, which help to close contracts more reliably. Furthermore they provide processes to enforce the fulfilment of contracts. In order to fully take advantage of the decreased transactional costs, big corporations and organisations will have to organise themselves more along market mechanisms and individual interactions instead of pre-defined processes and structures. In such an organisation the intermediary middle management becomes obsolete. Aggregating information from the bottom, dispersing decisions from the top and all other kinds of transactional work are no longer necessary in the way, they were done when information and communication technologies were not available. The possibilities of web 2.0 give even large corporations the chance to involve their employees at a level unthinkable just a few years ago. Additionally, knowledge work alters the way we work together. Individual contribution and work-related interactions are based on voluntariness – even within companies that pay salaries to their employees. Everybody decides for himself, what to do, how to do, with whom to do and what to do it for. Nobody can be forced to produce good quality in knowledge work, because it can not be measured anymore, if a job could have been done in a better way. The main motivation to achieve has to lie in the results of the work itself and in its appreciation. It is like volunteerism, a concept Peter F. Drucker often compared knowledge work with and which is the very basis of the market mechanism. The insights of Peter F. Drucker put the prevalent understanding of leadership upside-down. Employees have to define their work, their tasks, their responsibility, their contribution, the quality of their work, and have to control themselves. Managers enable and support them doing this most important work. Employees have to manage their bosses rather than their bosses them. Managers have to build an environment where people are able to perform. They support their employees and make them achieving. With the new technologies and the growing predominance of knowledge work it is even possible to put the whole concept of a corporation upside-down. Why should a small group of even very smart people at the top of a company know better what to do, what strategies to follow and what actions to take rather than the aggregated wisdom of the employees, who know their customers and products best and have day-to-day exposure to the competitors’ successes and failures? Up to the present companies had to employ a large staff of market researchers to aggregate and analyse market developments and customer needs, they had to employ a large staff of strategists and business developers to define business strategies and to communicate them inside the company, to change the organisation and people’s behaviour accordingly. How does this change with web 2.0? How do Peter F. Drucker’s insights get rolled out? Lots of employees often know very well and long before top management, what a company should do to survive and win in the future – especially in times of market changes. Sometimes they are right, sometimes they are wrong. But most of the times, the aggregated wisdom of the employees produces better results than isolated experts analysing aggregated reports and extrapolating the past. So using the brainpower of all employees to define the strategy of a company makes the company obviously more likely to survive and win in the long run than using the brainpower of just some of them. Several companies have incorporated this concept of developing new products or strategies already long ago. McDonald’s for example allows local franchisees to put new meals on the menu or experiment with new positioning strategies. If proven to be successful they get rolled out globally. Well known examples are the Big Mac (1967), the breakfast sandwich McMuffin (1972) and the kids-friendly Happy Meal (1979), exploiting new strategic markets like breakfast and family. Large pharmaceutical companies do not depend solely on their own research and development. They invest rather small sums in some independently-managed research and development start-ups. Once and if the start-up succeeds and the product gets approval they usually buy the company and market the product. How could strategising from the bottom-up be organised in the future? We still do not have the final solution but we see some of the potential ingredients. There are idea and voting platforms that allow employees and sometimes even customers and unrelated people to provide ideas and to vote on the ideas of others. This way the good ideas that lots of people support are crystallised out for the management out of a plenitude of ideas. Some of the early experiments are Dell’s ideastorm or Barack Obama’s Citizen’s Briefing Book. There is still some way to go, but ultimately web technology will enable ordinary employees to put topics on the agenda of top management and ordinary citizens to put topics on the agenda of governments. To build on the concept of bottom-up strategising it is instructive to look at direct democracies, where citizens can take initiatives and thus directly influence legislation since centuries. Web technologies will support these processes to a much larger extent. The role of management could be to pick relevant topics to the company’s agenda, to come to a decision, to approve action plans and to provide resources. They could be moderators of the strategy finding process, enablers of local implementations of these strategies, and promoters of locally successful strategies. As first executors of these strategies, they do not have to educate, convince or even change people’s behaviour anymore. They «just» have to unleash the energies of the people who proposed or promoted this strategy, and to provide the environment for these people to perform and to achieve. Just as Peter F. Drucker defined the responsibility of management. Performance management is often simply transferred from scientific management to knowledge work, too. So even for knowledge work it is often understood as to set (i.e. «command») goals for employees, to measure (i.e. «control») the results and to pay for performance (i.e. «reward»). If this process would lead to the best results in knowledge work, it would be reasonable to increase efficiency in the performance management process itself, that means setting goals by best practice templates, automate measurement by standardised indicators and objectify pay for performance based on benchmarks. But as Drucker put it often and in lots of examples, managing performance is the most important task of a knowledge worker himself. It does not add to the effectiveness of a knowledge worker to be told what to do without thinking through it himself. Therefore the supporting function of web 2.0 for performance management could lie in systematising the process of thinking through of one’s tasks, responsibilities, contribution and quality of work. The employee could share his thoughts in advance of the employee talk with his manager. The manager could comment and support in advance. It would be a rather ongoing process over a certain period of time than a once a year activity. Additionally the manager himself could grant his employees access to the definition of his own tasks, responsibilities, contribution and quality of work. The employees could comment on them, propose additional thoughts or requests and thus help him to define his own job. The next level could be, that all definitions are transparently published throughout the company and whoever has an idea is able to propose certain tasks or goals and to comment on existing thoughts. Such kind of working environments already exist in the open source software community or within companies like Google. Information and communication technology will enable and force companies to apply Drucker’s concepts on a broader scale. It is obvious that web 2.0 approaches will change the way we learn, we develop, we promote, we collaborate, we manage our boss, we recruit or we stay in contact with former employees. There are developments outside the business context in managing society, education, government, administration, health care or non-governmental organisations that start to apply Drucker’s concepts enabled by web 2.0 technology. We are just at the beginning of a promising journey – but not away from Drucker’s proven concepts but towards applying them more broadly. http://tiny.cc/citizensbriefingbook (http://en.wikipedia.org/wiki/Citizen’s_Briefing_Book). First reactions were quite positive, e.g. http://tiny.cc/citizensbriefingbook1 (http://www.huffingtonpost.com/2009/01/15/obamas-citizens-briefing_n_158035.html) or http://tiny.cc/citizensbriefingbook2 (http://change.gov/newsroom/entry/wrapping_up_the_citizens_briefing_book), although it is to be assumed that special interest topics of internet users still were over-represented. Something that probably will change with broader usage and further maturity of using these tools.